These fixtures are designed for indoor growers, and are suitable for a wide variety of plants, including fruiting or flowering plants. 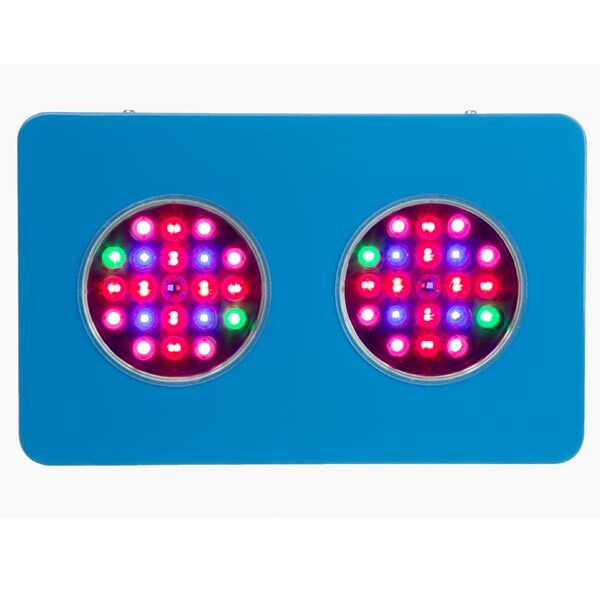 The lights have a scientifically developed and proven spectrum that can be used for all phases of growing. 125 watt grow light fixture with a steel body. The fixture runs on standard 120 volt power, drawing about 1.05 amps. A standard 6 foot power cable is included, as well as straps to hang the fixture. Advanced Light Spectrum is well proven for growing. The standard spectrum includes LEDs that provide broad spectrum light, as well as individual UV, Blue, Green, Red and Far Red colors. Optics over High Power LEDs focus the light so that the energy penetrates the canopy and deep into the plants. Recommended distance from seedlings and young plants is 36" and mature plants is 18" to 24" distance. Low heat output (In-house testing was 2 degrees warmer than room temperature). 14.5"L x 9"W x 2.5"H.